Specifies the working directory and command of a compilation. Definition at line 43 of file CompilationDatabase.h. Definition at line 45 of file CompilationDatabase.h. Definition at line 73 of file CompilationDatabase.h. Definition at line 67 of file CompilationDatabase.h. The command line that was executed. Definition at line 57 of file CompilationDatabase.h. The working directory the command was executed from. Definition at line 51 of file CompilationDatabase.h. 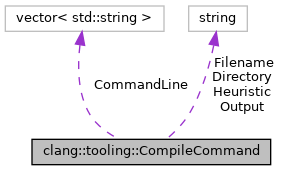 The source file associated with the command. Definition at line 54 of file CompilationDatabase.h. If this compile command was guessed rather than read from an authoritative source, a short human-readable explanation. Definition at line 65 of file CompilationDatabase.h. The output file associated with the command. Definition at line 60 of file CompilationDatabase.h.